Mmmm...Hummus. I like Hummus because it is a healthier snack, and it always seems to disappear as quickly as I make it! Which makes me think... "Why don't I make it more often?". Anyway, here's the easy, peasy recipe! - Roast red pepper and garlic each with a tablespoon olive oil. See Roasted Garlic. - In food processor, combine all ingredients until smooth. - Place in serving bowl, sprinkle with paprika. 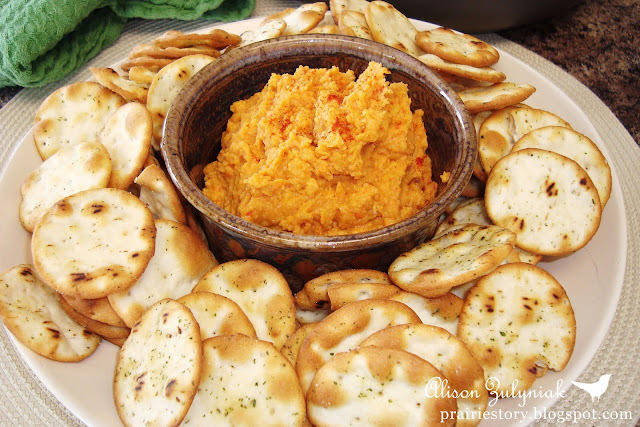 - Serve with crackers and raw vegetables, or use try using as a spread for sandwiches!